I have just signed the Parliamentary Petition here to keep bursaries for trainee NHS Nurses. The petition has 148,815 supporters (according to the map on the site 250 have signed from my West Ham Consistency. Parliament will debate this petition on January 11th. 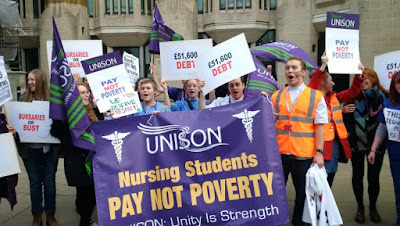 The Government is proposing to axe the bursary from next year and charge tuition fees for nurses the year after. This will mean that anyone training to be a nurse in the future could face debts over £50,000 for a starting salary of under £23,000. Trainee nurses are already expected to work for half of their courses on full time placements in hospitals. There is already a shortage of nurses in the NHS. This latest latest Tory wheeze towards the privatisation of the NHS will make the situation even worse.